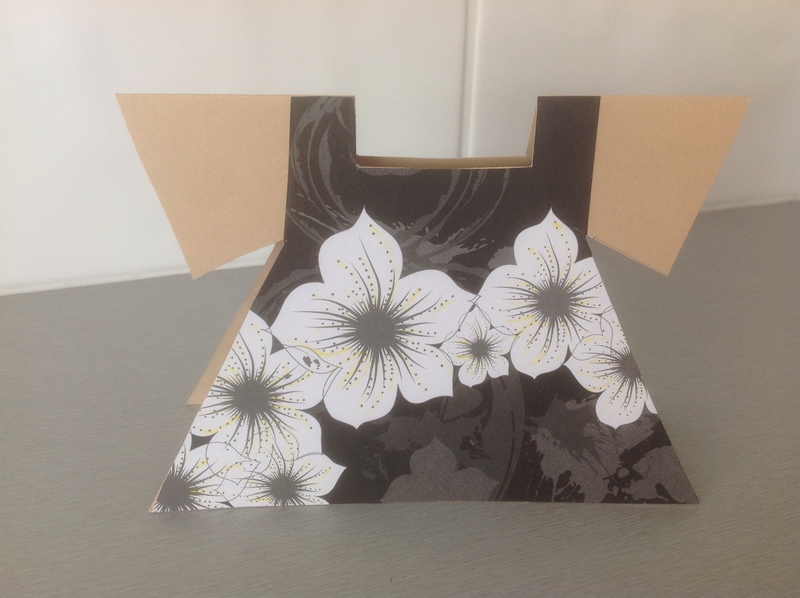 This is a little Hawaiian dress card that I made whilst playing around with making shaped cards. 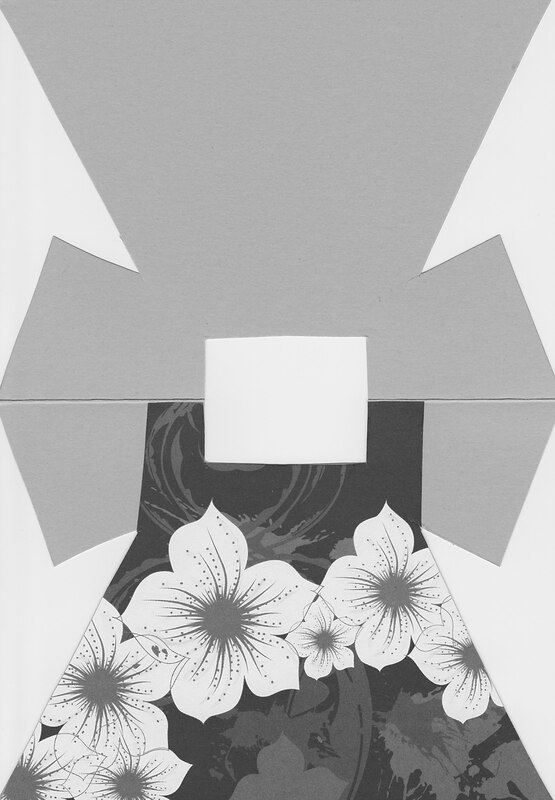 I had an idea that if I could cut a dress shape from a folded 4×6″ card and cut a dress from some pretty patterned 6×6″ paper it would look pretty neat. So I set to work, after a few attempts I have come up with a design I am happy with. 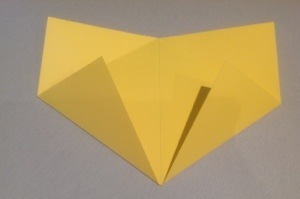 Below is the card flattened out in case you want to make one for yourself. It’s just a matter of cutting the neck, the dress sides and the sleeves. I have deliberately made these cuts a straight line to make it easy to cut out by hand. I always have trouble cutting a perfect curves by hand. You can of course embellish the dress with ribbon, pearls and buttons. That was my original intention but when I saw the way this gorgeous patterned paper sat on the card once cut out it really didn’t need much other than a little yellow highlighting on each flower. 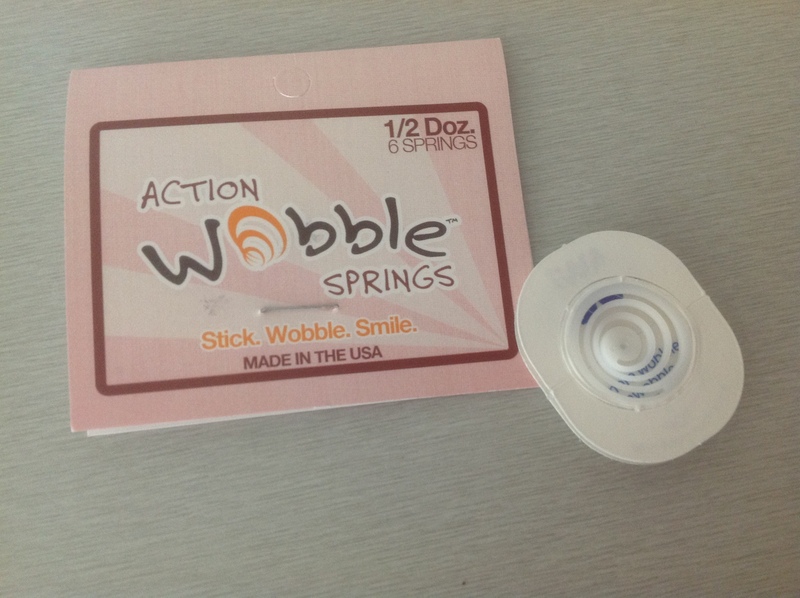 Wobble springs are a plastic spring with two clear plastic adhesives discs on either side which you can attach to any embellishment to add a “fun” element to your card or scrapbooking layout. They look like this. Here is what they look like when they are attached. And here is a card I made using the wobble spring. 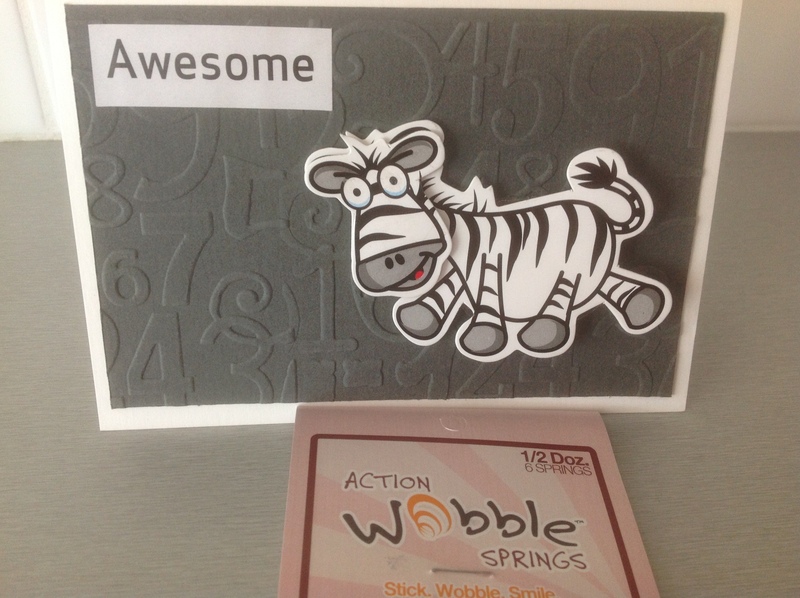 Well you can’t see it but the zebra wobbles around on the card when lightly pushed. I did think about doing a video but decided it wouldn’t be that exciting. 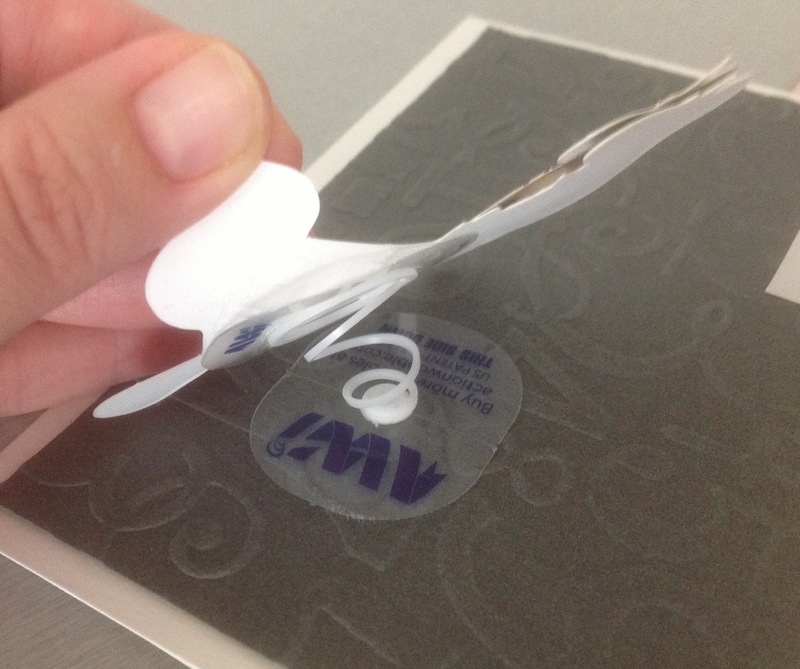 Just think of those cards in the shop where the pretty bit used to bob around – that’s the effect you get when you use a wobble spring. They are great fun for you when making and the recipient, so what are you waiting for. Get to it. OK I know it is trendy and popular now to use card sketches but I have always used them to record my card designs. So I thought I would show you a couple of examples of how to use a basic two “panel” design in three different ways. 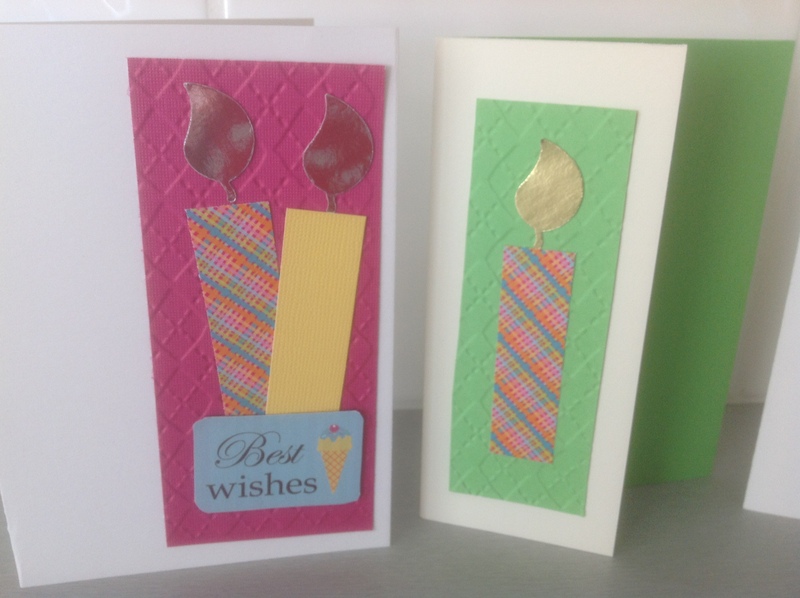 The card front is split into two patterns and then divided with an embellishment. A focal point is provided by using die cuts and stamped images. 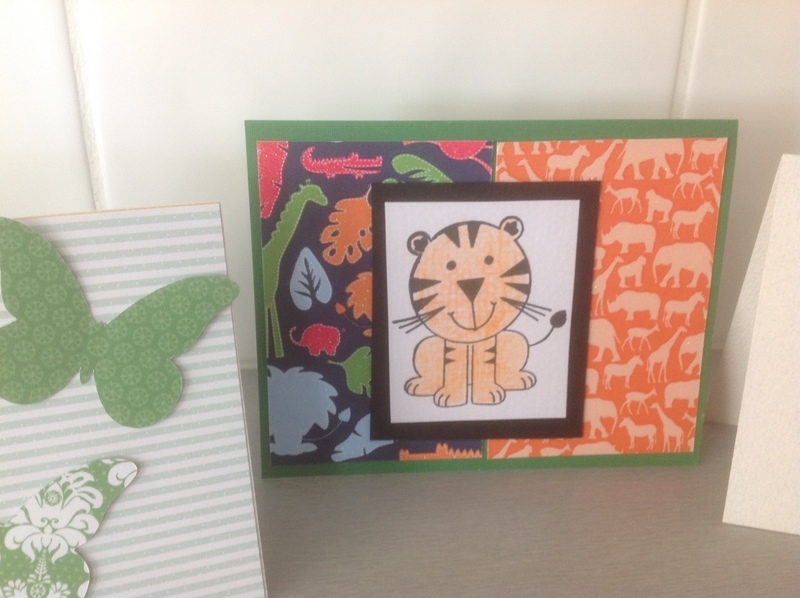 The first has a single patterned panel but being on textured card the use of the ric rac gives it the appearance of two panels. The co-ordinating die cuts completes the look. The second one has two complementary patterned papers from the same paper stack used on each side with a similar themed stamp used and coloured to match. 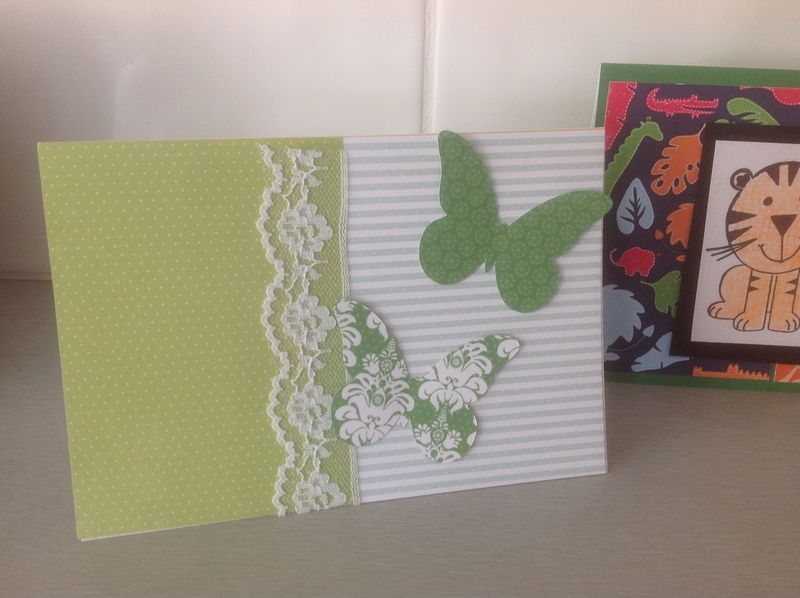 The last one which I think is the most creative using two green panels with a vintage lace separating and combining the panels with two gorgeous die cut butterflies. Both butterflies follow the theme of the card – one from a lace like paper and the other from a deeper green patterned paper. So next time you are creating a card think about how you can use the same design in different ways to create a few more cards for your stash. 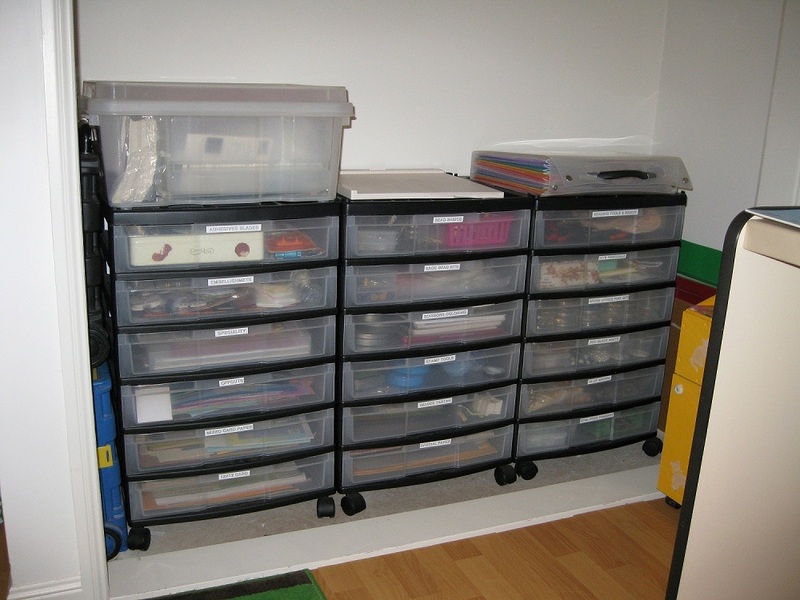 I have experimented with a few solutions to organise my craft stash. The current solution which I have been trialling for almost a year seems to be working. 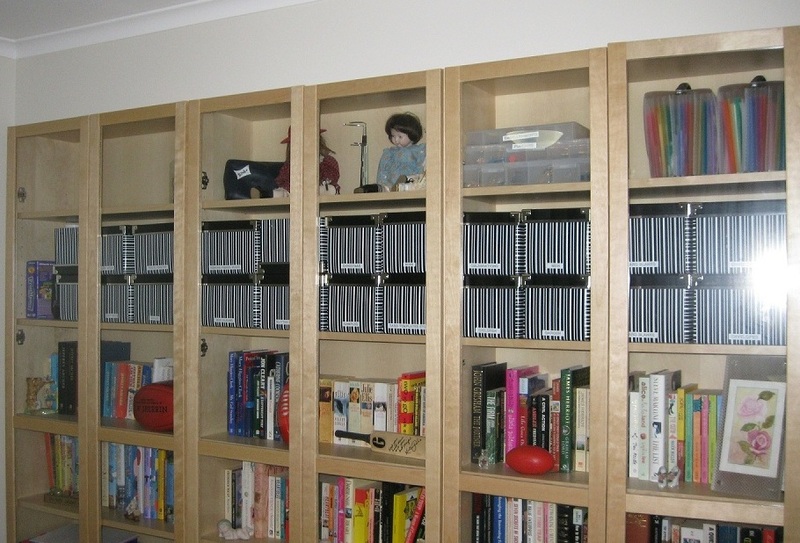 As I have my own study/craft room I purchased 3 Billy book cases from Ikea with glass push to open and close doors. The glass doors triple the cost of the unit but they are worth it. Not only do they look fantastic it keeps the dust out which means more time for playing with craft bits. I also purchased at the same time DVD and CD boxes designed for the Billy bookcases. As you can see I have quite a few now. The theory being that I have a box for everything, each is labelled with what’s in it. 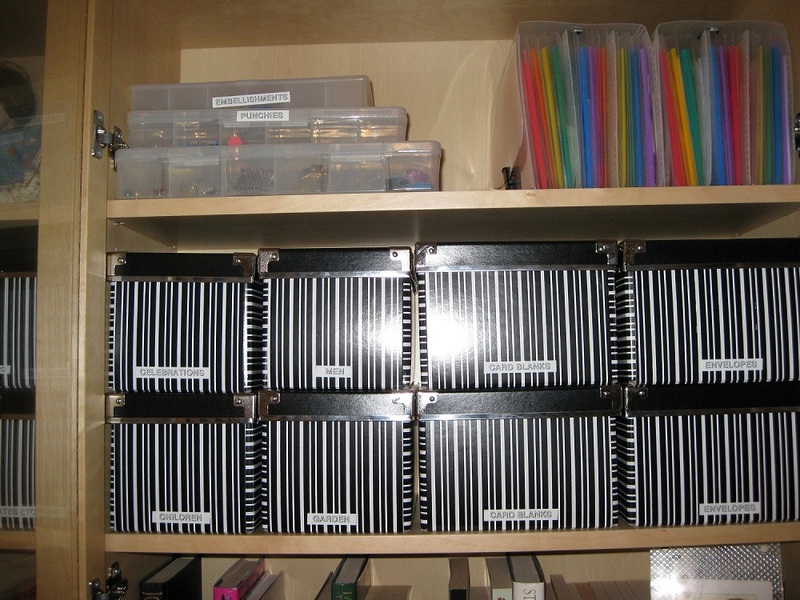 I have now managed to fill the balance of the space with my cling stamp storage (old DVD cases) and embossing folder storage (A5 display box) plus a couple of photo boxes to hold made cards and other items. But you ask how did I decide to break up my stash, it took awhile but it’s basically on theme or type of. These are my boxes: card blanks, envelopes, celebrations, men, kids, garden, misc, samples, tags & templates, glitter and stencils, christmas, ribbons, mini albums, embossed paper. Anything which is too large for these boxes heads to the 12×12 carts which I acquired from Kmart (Australia). I have now been through the boxes on the top and replaced them with three top closing 12×12 stackable containers – Kmart(Australia) has these for $12 each. Bargain as the same item at the local spotlight (craft store) is $22. I have found this to be just the solution I was looking for now when I sit down to make a birthday card I pull out the celebration, male and/or kids box to get my creative juices going and then if needed pull out the ribbons, embossed paper etc to coordinate. Hope this gives you a few ideas. 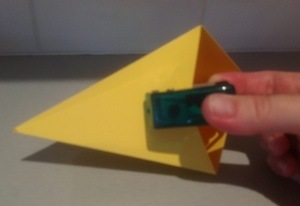 How to make a triangle gift box – perfect for treats! A love little gift boxes particularly those which can be made quickly easily and without too much measuring and pfaffing about. So it is no surprise that I love triangle gift boxes. 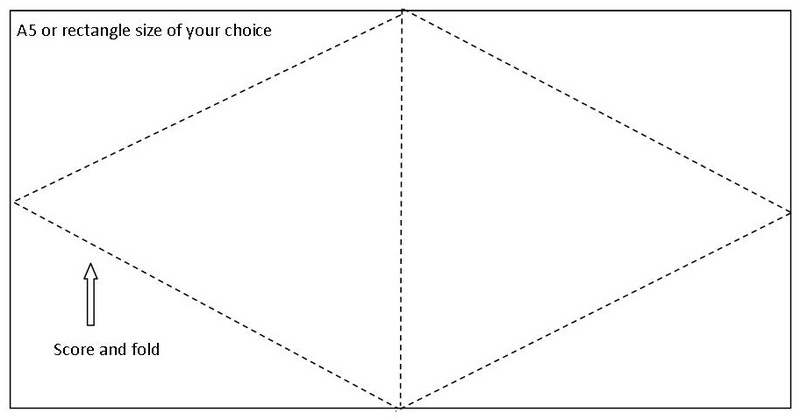 You start with a rectangle, A5 or 5×7″ card is perfect and then score as shown below. 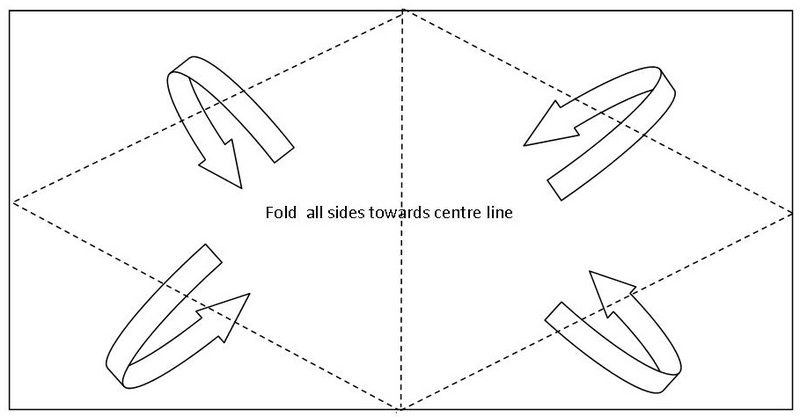 Then fold all sides towards the centre line (running length wise e.g. short side to short side). See below. Then the tricky bit with all sides folded in, fold short side to short side and hole punch the two left pieces and then the two right pieces. See the photo below. Thread a ribbon (I’ve used black so it is easier to see) through the holes on both sides and tie a box. Presto! 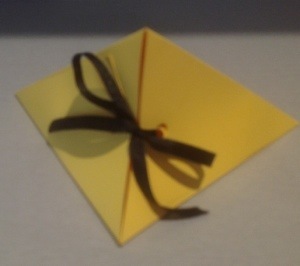 A cute triangle gift box ready for decorating and filling with goodies. I think I will make and decorate a few of these for easter in pastel colours and maybe some in orange, yellow and blue! Whilst I am happy for you to use the designs to raise funds for charities and not-for-profit organisations please do not use these commercially. Till next time. 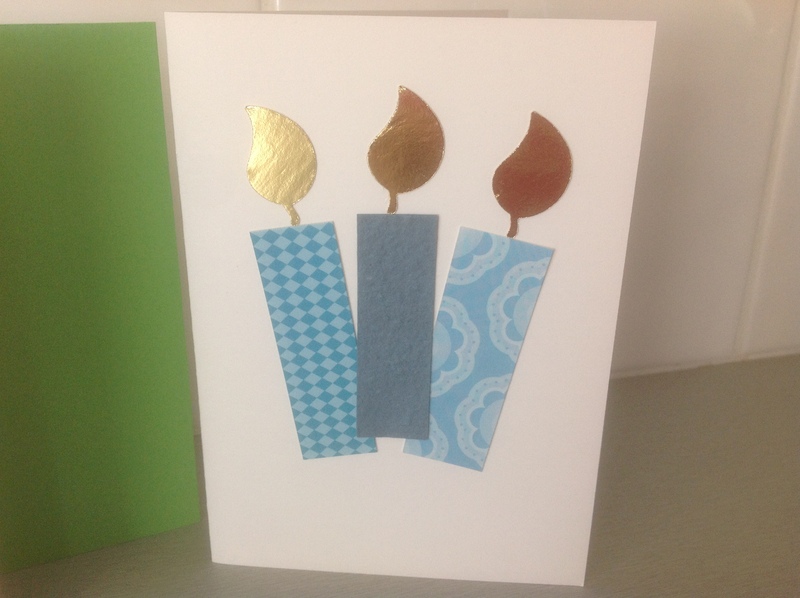 Todays blog is about birthdays and specifically how to use your offcuts to create a cool one. This is my very first original design. I started with a simple challenge of using little offcuts (2cm wide x 6cm high) as candles. Initially I used glitter glue to draw a flame shape but now I have purchased a nice leaf punch which also works fantastically although I still do like the look of the glitter flame. I use any material for the candle base – corrugated card, foam, patterned paper, embossed paper, card and keep these in various sizes in a snap lock bag ready to go. I find, as I always like to keep stock on hand for myself, to give away and lately to add to my etsy shop it is a big time saver to make multiple cards using the same design. This simple candle can be used on its own, in pairs, in trios, with or without a background or a suitable message. 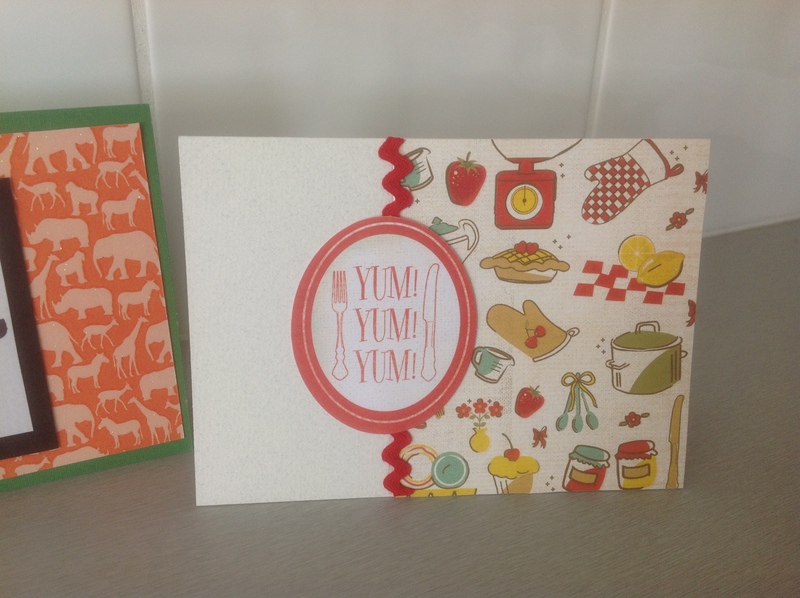 The trio of cards pictured below took around 10 minutes to make with most of the time taken up by settling on the colour scheme, background and message to be included. Whilst I am happy for you to use the designs to raise funds for charities and not-for-profit organisations please do not use these commercially. Till next time.